Billy Bragg’s notion of “Englishness” has taken quite a beating lately. First came the 2005 London subway bombings, perpetuated by homegrown terrorists who spouted jihadist rhetoric in broad Yorkshire accents. Ten months later, the BNP—an overtly racist, right-wing political party—won a dozen seats on Bragg’s hometown council. It’s just the sort of group the socialist folkie-punk railed against in the ’80s at Rock Against Racism concerts alongside cohorts like Joe Strummer. 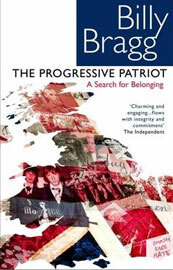 Bragg’s response this time was The Progressive Patriot, a political autobiography that weaves everything from the medieval Levellers to Bragg’s great-grandfather’s dockworker strike to The Clash into an English tradition of inclusiveness and progressive dissent. Patriot bogs down at times, at one point taking chapters to prove the obvious connection between ’60s protest singers and English tradition. But at its most personal moments, Patriot succeeds admirably, reclaiming everything from the folksong to the flag in the name of Bragg’s English Lefty.